The former is pretty standard; the latter is an explicit implementation of the interface method. When our ContentDeploymentJobCollection object is used as an IEnumerable, like my test variable and in HandleEnumerable (and presumably in the PowerShell runtime), the explicit implementation is used and throws the exception. On the other hand, if we make PowerShell use the implemented GetEnumerator, everything works as expected. 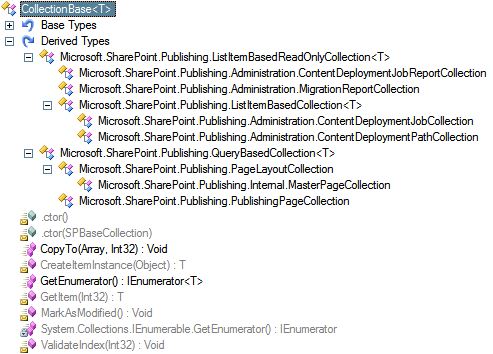 So if you’re getting a NotImplementedException when using a collection that inherits from Microsoft.SharePoint.Publishing.CollectionBase<T>, make sure you’re calling the correct GetEnumerator. Posted in Object Model, SharePoint. Tags: ContentDeploymentJob, ContentDeploymentJobCollection, Explicit Interface Implementation, GetEnumerator, NotImplementedException, SharePoint.Publishing.CollectionBase. Comments Off on ContentDeploymentJobCollection GetEnumerator Not Implemented?